Scalamandré – WHAT IS JAMES WEARING? Scalamandré has been one of my preferred resources for the most beautiful fabrics, trims and wallpapers. Their distinguished reputation has made them the go-to fabric house for some of the finest and most important interiors in America, including the Kennedy White House! Many of their fabrics have been used in the restoration of my favorite Newport mansions as well, including Marble House, The Breakers, and Rosecliff. Scalamandré has quite a rich history but great breadth as well, and I’m always thankful that they maintain a firm understanding of what today’s designers and clients want and need. For a start I might use the “Oiseau des Exotiques” in sage silk – this is a super chic warp printed taffeta based on a French document. I adore this fabric for its clean, clear and fresh coloration – very much in keeping with my own design aesthetic. I would then work in a mix of the most luxurious fabrics in scrumptious colors, several solids in different textures, and a spectacular stripe I found that has almost all the colors of the print – this gives the mix a cleaner, more contemporary vibe. Featured left to right – Skipwith linen/silk damask in lavender (I’d use this on some comfy club chairs); Sunset silk taffeta stripe and Tulip tieback (for the curtains); Folio turquoise silk velvet (sofa pillows); Oiseau des Exotiques – sage warp printed silk taffeta (on a pair of Louis XVI bergeres and pillows); Kilfane damask in taupe (on sofas) with Gripsholm fringe in flax and cream, Gloss polished cotton/linen in acid green ( I’d upholster the walls in this) arabella braid -green (to finish the edges of the upholstered walls) and Pitti cut velvet in Venetian red (on chairs and pillows) with A tassel silk fringe from the Edwards collection. And Voila! – There you have it – a vibrant and youthful quiver of fabrics that would certainly make the most gracious drawing room for your very chicest friend! 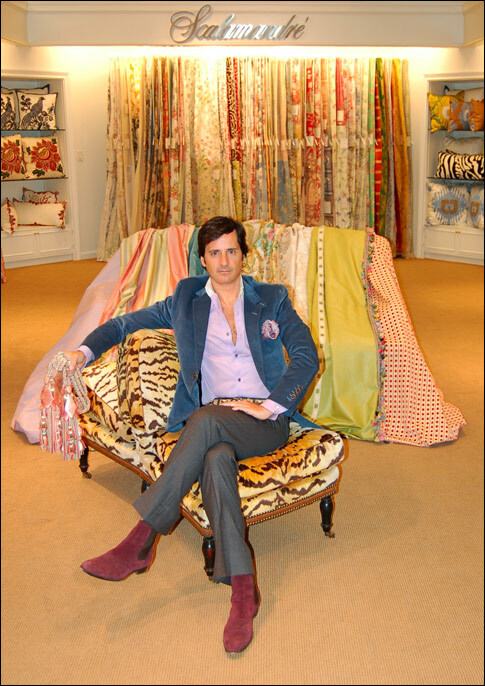 I’m posing (top) amidst the sumptuous splendor of my recent Scalamandré selection, on a gorgeously outrageous “Dos a Dos” throne upholstered in tiger silk velvet – I’m wearing A Gucci slate blue corduroy jacket with matching twill elbow patched and tab, buttons are silver and leather, lavender end on end cotton shirt with French cuffs and contrast white collar and a brown and lavender polka dot silk pocket square – both by Tom Ford, Seaman Schepps silver pearl and blue sapphire cufflinks, gray flannel pants and python belt both by Gucci. Yves Saint Laurent aubergine “Eton” boots complete the look. I had so much fun bringing together these ultra luxe fabrics – reminded me a bit of Sofia Coppola’s 2006 Marie Antoinette! – If you haven’t seen, then you must! I’ve included a little snippet here to get you in the mood for your next Scalamandré visit! – enjoy.